Polaris (Lorna Dane) is a fictional comic book Character appearing in books published by Marvel Comics, in particular the X-Men family of books. Created by Arnold Drake, Don Heck, Werner Roth and Jim Steranko, Polaris first appeared in The X-Men (October, 1968). For most of her publication history, she has been a superheroine, and a member of either the X-Men or one of its sister groups, such as X-Factor, though from 1987 to 1989, she was possessed by a villainous telepathic entity, and functioned as the supervillain Malice - More about Polaris (Marvel Comics) Character Review...keep reading !! A mutant, Polaris can control magnetism, much like Magneto, whom she long suspected to be her biological father, a fact confirmed in Uncanny X-Men (2003), making her also the half sister of the Scarlet Witch and Quicksilver. She has also had a complicated long term relationship with the X-Man Havok, to whom she was engaged. 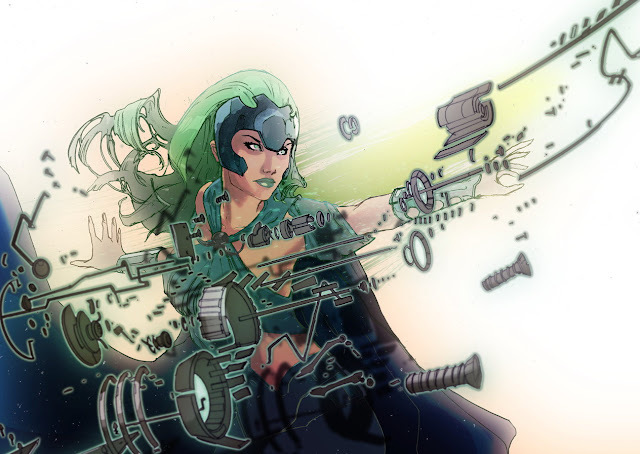 Polaris' powers enable her to sense and control magnetism, including manipulating metals which are susceptible to magnetism. Her powers come from celestial technology that reactivated her x-gene as proven by Cerebro. 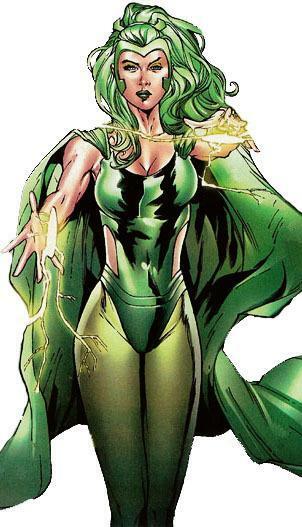 Polaris can generate magnetic energy pulses, create force fields, manipulate the Earth's magnetic field, and allow herself to fly, By concentrating, Polaris can perceive the world around her solely as patterns of magnetic and electrical energy. She can perceive the natural magnetic auras surrounding living beings as well. She has bright green hair, the first indication of her mutation. At first, she dyed her hair brown to hide this, but later she appears with her characteristic green hair. 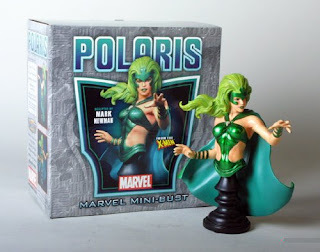 Briefly in her history, Polaris lost her magnetism power, but gained the ability to absorb negative emotions from the environment and use it as strength, endurance, invulnerability, and the ability to temporarily increase her height and mass. She eventually lost these additional powers and her original magnetic powers returned. 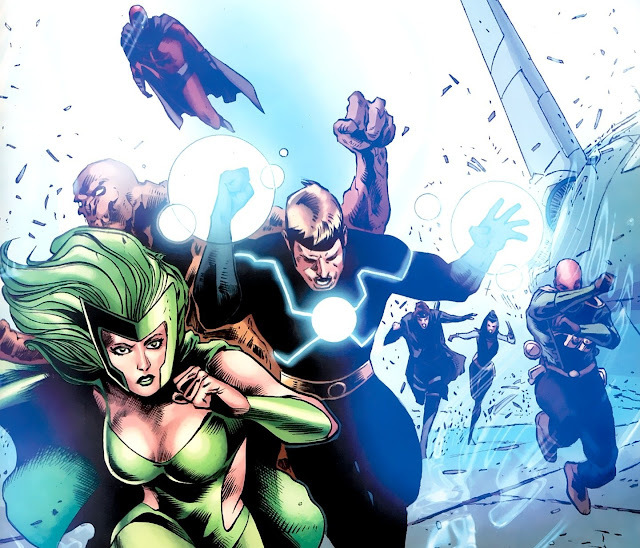 Polaris was among the mutants depowered by Scarlet Witch during the House of M storyline. However, due to Apocalypse's manipulations, Celestial technology restored her x-gene returning her natural magnetic abilities. The limits of her magnetic powers are unknown, she is referred to as one of the biggest threats of the current team by the opposing Shi'ar Imperial Shockers, cybernetic guards. In the "Emperor Vulcan" she shields the Starjammer against the attacks of a whole fleet of starships and was shown to directly destroy at least one enemy battleship with a magnetic blast. As the Horseman Pestilence, Lorna had shown the ability to ingest virulent diseases without harm, absorbing their traits, and according to Apocalypse is able to spread a "meta-plague" that will kill anyone who has not been inoculated with the virus' vaccine, the Blood of Apocalypse. She had also been shown to fight off toxins and drugs quicker than normal. Lorna possesses expertise in geophysics, and has earned a Masters degree in that field. Polaris appears in the animated television series X-Men, voiced by Terri Hawkes. In the episode Cold Comfort, she is a member of X-Factor. Polaris had been a member of the X-Men alongside her boyfriend Iceman, though they eventually left to pursue a normal life. However, Polaris left Iceman and became a member of X-Factor and fell in love with Havok. She returns in the final season to help battle the Phalanx. Polaris appears in the animated series Wolverine and the X-Men, voiced by Liza del Mundo. Unlike the comics, she is part of Magneto's family with a very close relationship with her father on Genosha. In the future during the episode "Badlands," Polaris was the sole survivor after Genosha was destroyed thanks to Magneto's last-minute attempt to save her, leaving her mentally unstable. In the present, she forms a brief attraction to Gambit when he tries to steal Magneto's helmet as part of a larger plot, though he later ends their relationship, causing her to angrily leave him stranded out at sea (causing Gambit to remark that she has her father's power and her older sister's temper). In the episode "Foresight" Pt. 3, her future self assists in the X-Men's fight against Master Mold, but Master Mold proves too powerful for them to defeat. However, in light of the X-Men in the past's intervention, the Sentinel-run world is avoided. Back in the present Polaris later turns her back on her father and watches him get banished as Scarlet Witch has Blink teleport Magneto and Quicksilver away.